Of all the old tuning houses, Speedwell probably has the most star-studded history. 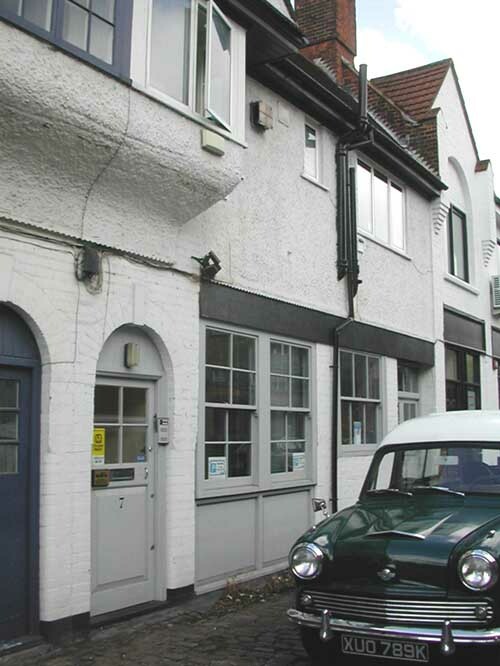 The company, Speedwell performance Conversions Ltd. has its origins in a London coffee bar, where fellow racers John Sprinzel, Len Adams and George Hulbert, amongst others, regularly met. At one such session, in 1957, Sprinzel was moaning about the cylinder head of his racing A35: Hulbert offered to rework it for better performance, and consequently Sprinzel won his next race. After the race, Sprinzel was interviewed for television, and mentioned his new cylinder head - the response this created was sufficient to prompt the racers to set up a tuning company, named after the local telephone exchange - Speedwell! Adams acted as salesman, George Hulbert was development engineer, looked after the administration and publicity. Some time later the trio were joined by "up and coming" racing driver Graham Hill, Graham joined Speedwell well after the company was established, and took the position of work's foreman because at the time Colin Chapman wouldn't give him a race drive while he was so good at his job. In reality, being 'in charge of the workshops' meant that Hill was acting as fitter fitter bolting the latest tuning gear onto Speedwell's very competitive A35's. The A35 driven by John Sprinzel and later by Graham Hill along with Speedwell-modified Austin Healey Sprites were raced to many victories bringing much good publicity to the company. By the end of 1959 John Sprinzel decided that his future lay elsewhere, so he left Speedwell to start up his own very successful tuning firm, in so doing he sold his shares to Graham Hill, who had become "Chairman shortly before. This "promotion" was mainly due to the good publicity having a successful Lotus works driver as Chairman does for a tuning firm. In 1960 Hill drove the Speedwell Streamliner, a modified Mk I Austin Healey Sprite with streamlined aluminium bodywork (by Frank Costin), to a Class G world record of 132.2mph. 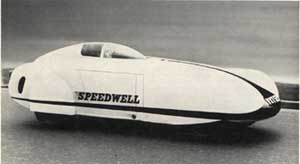 Speedwell business was based around the BMC A-Series engine, but tuning parts for the larger B-Series were also supplied. To further add to the tuning package, Speedwell could offer suspension, brake, final drive and body modifications, mostly for the BMC cars of the time, although some parts were sold for non-BMC models - an interesting example is the rear suspension camber compensator for Volkswagens, Renault Dauphines and the Triumph Herald based cars. (The original) Speedwell (Perfermance Conversions Ltd.) ceased trading in 1969. In fact Graham Hill bought the company from the Receiver and became the owner. Lutz Arnstein became the export agent and an accountant was appointed MD of the new company Speedwell Performance Conversions (1969) Ltd. Unfortunately, in less than a year they were in trouble again! The MD was sacked and Graham offered me the job.We had got to know each other because I was the MD of Ian Walker (Service) Ltd, a company set up by Ian who had been the privateer who ran Team Lotus, before they started to do it themselves. Ian and Graham had known each other for years. We speciallised in the supply and service of Lotus kit cars and we, also developed a range of tuning equipment and reprofiled camshafts. I managed to turn Speedwell fortunes round and we ran reasonably successfully for about four years, selling exactly the same gear as the previous company from premises in Chesham, Bucks. (which Graham also owned). I was eventually, fired for telling Graham he made a better racing driver than he did a business man. Something I regret now, but, at the time thought needed to be said! The new company developed several interesting products and did not rely only on its previous products. For instance we developed a range of "Graham Hill" motor accessories, including Rally Jackets and gloves, bolt on electronic rev counters and shrink wrapped bits and pieces, of all sorts. The engine tuning continued, as before, so there must be many genuine tuning parts (including cylinder heads and full engines) up to and beyond 1975, when the company did eventually fold - no doubt, due to the appointment of yet another, accountant, to run the company! I would like to thank both John Sprinzel & Colin Hextall for their help in the writing of this section, it would be a lot less accurate without their kind input. A genuine innovator in performance tuning. From left to right John Sprinzel, George Hulbert, Graham Hill, Len Adams & Lutz Arnstein. 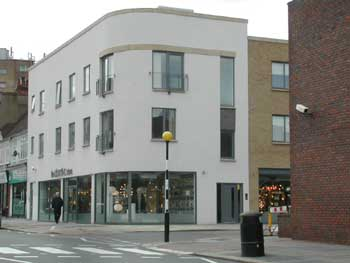 Where it all began, John Sprinzell's flat,7 Accomodation Rd.